I do not nor ever have liked your creepy crawly spider-like body, legs or anything about you. I'm not sure why you must be around to torture unsuspecting characters like myself. If I'm digging in my flower bed, you like to jump out at me and send my heart to palpitating. I also don't find it very funny when I'm using the ladies room (yes, it's a ladies room when I'm in there....when the kids are in there, it can be a bathroom, 'the john', or whatever other cute little word they come up with) and you decide to either scamper across the floor in front of me or run up the wall beside me. Running across the floor in any part of the house is also not appreciated. Oh, and by the way, you should have warned your little spider friend that likes to hang out on my mailbox that I don't like that either. The little Clorox cocktail that we gave him ended his parcel post adventures. I never dreamed that you would even have the audacity to make your home in my car. I know you are there because you leave a mess when I'm not in there. Webs everywhere....on my dashboard, across my steering wheel, along the window and all around. I don't think that is very considerate of you. My kids are trying to be nice to you by leaving you food to munch on, sticky cups to feed your sugar tooth and anything you could ever want to make a home in. The least you could do is be a little bit grateful. There is another situation I must address. I do not like it when you try to crawl up my leg when I'm driving. Swerving from lane to lane recklessly is not looked on by the police as being a good driver. I had to pull over two times the other day because you decided to scamper across the window and dashboard while I was trying to get to the store. I wonder what people thought as they passed me by. They probably were wondering what that mad woman was doing with her shoe off, whacking everything in sight. Since you've shown no consideration in your new home and are refusing to find the quickest exit. Please find yourself served with an official eviction notice. You do not have thirty (30) days. That is only for humans which you are NOT. You are expected to leave immediately. The next time I enter my car, I expect you to be gone for good. Keep in mind when making your choice that it is best to choose wisely. I have a Clorox bottle and I'm not afraid to use it. I also have three boys who could decide to use you for a biology project. Yes, my friend, school is starting up in just a few days......days in which you are limited on. There is this wonderfully hilarious auction that hit Ebay recently. I know this, not because I am an avid Ebayer but because it hit my 'inbox' like 50 times from different people I know. It took me like a couple days to get to it because well...I've got five kids. Should I explain further? I have to say if you are currently surrounded by children, once were surrounded by children or even know somebody that was or is surrounded by children, it is a must read. It will give you a glimpse of or a reminder of what life is like. As I was reading it, I felt like I was reading a snippet from my life only it was funny and had me in stitches whereas when things like that happen to me, I'm just a crazy yelling fool of a mother. Take a minute, or two or three to check it out! Brad recently turned 12 and is chomping at the bit to earn some extra money. He has agreed to babysit for me when I've got some errands to run. This is a good idea except that no one ever wants to stay home. They have an alert system in place that goes off in their cute little heads, the minute I put my shoes on. It goes off even if I only put my shoes on to go into the laundry room, so that the sand that is from one of our recent camping trips doesn't stick to my feet. The shoes go on and I've got five little children surrounding me as close as they can get till the oxygen in my personal space is all used up and I have to bolt to another location of the house to get a breath. About a week ago, I had some errands to run and decided that if I took the "twins" (they are not really but people ask) that maybe that would remove some chaos from the home, leaving Brad to have quiet time as Kara was napping. After two of the errands were completed, I excitedly thought to myself that I was still sane and intact as a calm Mother. 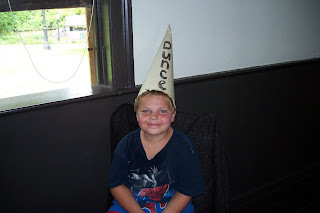 The boys were a little rascally but nothing that sent me into crazy-mode. My third and final errand was the grocery store. I agreed to take the boys because I wasn't going for a full grocery store run, I just had a few things to get. Don't ever let that thought fool you....it never is just a few things when you have a posse with you. The minute we hit the parking lot, the rumble of running feet could be heard clear to Tacoma, Washington. I grabbed my purse and was off on a run to (hopefully) catch up to them before they stormed the grocery store. Upon entering the store, the cute little carts they have with a car attached to the front for the kids had them fighting over who was going to sit in it first. By the time I caught up with them, both of the buggers were in the seat at the same time trying to push the other out. That should have been my cue that we just walk back out the door and leave immediately. But do I listen to my instincts? Noooo....that would just be too easy. I need a challenge daily, apparently. We made it through the produce department with only one lady getting angry at us because we were blocking the banana's while we were fighting over which bunch to purchase. Let me ask you, because I was under the assumption that a banana is just a banana, I didn't realize there were preferences to which banana would taste better....do you know? My two boys do know and were loudly explaining that with crying between words. We then came to the lunch meat counter. There weren't many people standing there so I foolishly thought that I could get what I wanted rather quickly, before their attention span ran out and were off and running down the aisles. The meat cutter person couldn't find the ham out front that I asked for, so he had to go in the back, which took forever. In the meantime, the boys are bringing me stuff to put in the cart because they are trying to 'help'. Between gritted teeth, I was trying to get them to understand that Mommy's patience level was leaving the building and she didn't want to start screaming so early in the grocery store shopping adventure. They were oblivious. After fighting with them over and over again with who was sitting in that stupid car cart, cookies, kool-aid jammers, pop and chips, I decided that I'd had enough to get us by for a day or so and that it was INDEED time to leave. While I'm trying to get through the checkout, the boys beg me and beg me for quarters that they want to put in the machine. Now you might think they are trying to get gumballs or something of that nature, but that isn't what they are wanting the quarters for. Have you ever seen the big red vending machine with all the flashing lights that happens to dispense lottery tickets? Yep, that's what the boys want. I tried to explain to them that those were the big people's gumball machines, (heh) but they wouldn't listen...it's pretty, flashy and is sure to dispense some wonderful treasure. Perhaps the grocery store bagger felt sorry for me, or perhaps they were just trying to help me exit as fast as possible and loaded up my cart, pushing it out the door to my car for me. I think he was trying to be helpful and he was since I needed both of my hands to drag the cute little boys out the door before they really discovered the gumball machine that was meant for them. After loading the vehicle with our groceries and getting them buckled in, I fell into my seat exhausted and desperately needing chocolate (that I forgot to purchase for me) or a Starbucks. I was overwhelmed with the reminder that I really, really need to stick to my 'one kid' rule. Don't let those lit up faces with adorable smiles melt your heart so you give in and let them go with you.....it's only their evil plan. 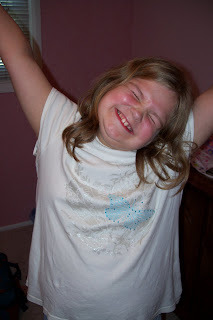 Grace's room is finally finished....except for the putting in of her stuff. It's been a long two months of waiting and waiting but Grace was a trooper! 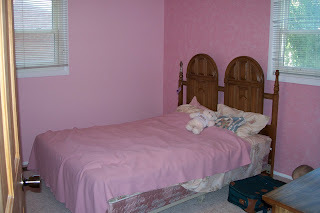 Three walls in her room are painted with pink pearl and the main wall is painted with pink eraser. The main wall also has a faux finish making it look shimmery.....just the way she likes everything. It is definitely full of girl power. Kara has also taken a liking too it and thinks she should be in there all the time. I didn't even have to mention to her that it was the 'girl' room. It's quite the popular hangout. The brothers are already helping themselves to the world of pink and don't seem to be the least bit bothered by so much pink. Unfortunately, Kara's crib didn't fit in there with the queen-size bed and long dresser so we are going to have to look into a different scenario for sleeping whether it be bunk beds or something else. 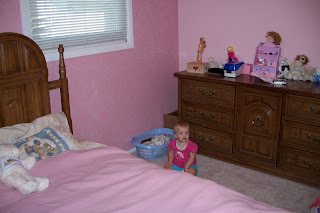 It looks like Grace will get her wish for now......Kara stays in her parents room but her toys and clothes are going in the pink room! We are so thankful for all the work our friends volunteered to get the room in order. I'm also excited that my girls have their own room to enjoy and I think they are too! We recently got a recall notice in the mail for our dishwasher. I kind of snickered at this because it's like eight years old and has several indications that make it evident that it's a tiredly, well-used dishwasher. As I opened the letter, I kind of scanned it and set it aside. Then all of the sudden the words "fire hazard" sunk in so I picked it up to read more thoroughly. Yes, indeed, our loyal friend was given a dangerous label. We called the manufacturer and were given the option for them to send out someone to fix it but we would have to pay for the other things that were wrong with it OR they would give us a credit towards a new beauty if we were interested in purchasing another Maytag, Whirlpool or Jenn-air product. As my husband laid the decision before me, I said "Sold!" You had me at 'New'! It was a done deal with them promising to send out a rebate form. (Yes, I know...ugghh...a rebate form) After finishing up our call with them, I turned to look towards my mountain of dishes as my thoughts wondered off to a far away place where there's never a dirty dish. There nothing more mountainous in a big family then dishes and laundry. Now I must tell you that I can't go without my dishwasher. Why, I'd have to hand wash them. That's a no-no in my book. How could this be happening. What did I ever do to deserve this punishment??? Why is it that there must be a waiting period between getting rid of the old and bringing in the new? It's...it's just not fair, I whimpered. Then a thought (not one of my more brilliant ones I admit but necessary for my sanity) came to me. The problem was that the jet dry would leak and come into contact with the heating element which would then start a fire. BUT....what if your jet dry was all out and had been for awhile. Would it ignite if you were to use it IF, IF, IF it were empty leaving no opportunity for any leakage? Well, in my mind it worked, sounded totally logical and just plain made sense. So I used it some (**snicker) but only if I was going to be right there with it coaxing my loyal friend along. It did me right and kept going not giving an inkling of smoldering and I'm thankful for it's long time service. 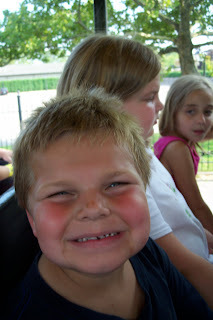 Ryan talked about riding the train at Greenfield Village for a month before his birthday arrived. That is what he wanted to do, nothing more...nothing less. Can we go now, Mom? Is it time yet, Mom? When are we going to ride the train, Mom? This is what was being said over and over. The day FINALLY arrived and he was just about jumping out of his skin. 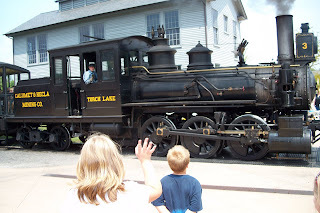 It was a beautiful sunny Sunday, perfect for a train ride. (sshhhhh....don't tell anyone, we skipped church so we could get an earlier start. I'd hate to think word got out on the street that we weren't there.) We all loaded up in the 'zurban' and headed on down there. Ryan thought we were going to ride the train right when we got there so it was very hard for him to wait until a little later in the day. Especially since the train was the first thing we came across as we entered. He did get a good look at it though! We were trying to pace ourselves just a bit and not do everything all at once. We ventured forth and ran into a beautiful horse whose brown fur glistened in the sun. As Grace was petting his nose we asked what his name was and was met with..."Her name is Grace!" So now our Grace has met a fellow Gracian. How cool was that?! I'm not sure she was as amused as I was. We visited many of the little houses, watched glass blowing, pottery molded into mugs, paid attention as class was being demonstrated at the old schoolhouse, asked questions in the courthouse and saw a bit of a live play. We even took a break and had an ice cream. 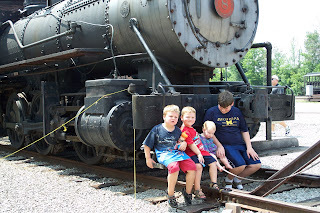 And.....Ryan got to take his train ride! He was grinning ear to ear when he got off displaying how pleased he was. 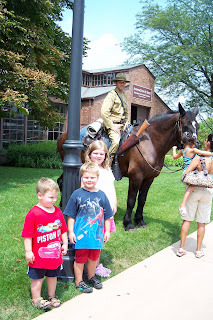 Greenfield Village is one of our favorite places to visit. The people who give their time there are always willing to answer your questions. I love the fact that there is a lot of interactive things to do that draws kids and adults in and only adds to a wonderful experience. We've visited also at Christmas time and it's really beautifully decorated along with an old fashioned holiday feel, it's a must-do. We give this place a seven thumbs up! I beg you, please, to hush that sound!